How to Remove Tar From Your Hardwood Floor | Mahogany, Inc.
Tar is a substance that often sticks to our shoes, and we track onto our hardwood floors after coming from outside. There are many functional values, one place that you don’t want to see it is on your hardwood floor. Tar is a substance that often sticks to our shoes, and we track onto our hardwood floors after coming from outside. You can find tar in the woods and on roots. One of its primary functions is to seal shingles on roofs. Another use is to keep the wooden hulls on ships from decomposing or deteriorating. If you dilute tar, it can help in spicing meats, flavoring candy, and found in some cosmetics. There are many functional values, one place that you don’t want to see it is on your hardwood floor. Tar is hard to remove, and if you aren’t cautious, you can damage your hardwood floor especially if your wood is foreign or restored. Keep reading below for some tips on how you can carefully remove tar from your hardwood floor. Did you know that you can remove tar from your hardwood floor with a popsicle stick? You can even use an everyday cooking item such as a plastic spatula to get rid of the gunk. If you use a tool that’s too sharp like, let’s say a cutting knife, you can permanently damage your hardwood floor. How does ice work you may ask? Placing a few ice cubes sealed within a plastic bag on top of the gunk will result in it freezing. Once the tar changes form and freezes, you can pick up the pieces. A scouring pad removes tough, caked-on dish stains so why wouldn’t it work on your hardwood floor? If you find that your hardwood flooring is a sticky mess, you can use a scouring pad to scrub the difficult stain away. Make sure that the pad has a nonabrasive grade as not to ruin your floor. Put elbow grease into your small, circular motions and see the tar come right up. When most people think of acetone, they think of nail polish remover. Acetone does for the nails what it can do for your floor. Use this chemical on laminate floors only. Pour a small amount onto a cloth, focusing on the sides of the tar and then progressively working your way to the middle. You want to prevent the mess from spreading. Whether you are ready to purchase your new front door or still have some more questions, Mahogany Inc. has your back. Call us at 410-727-0334 with any questions and speak to one of our licensed professionals. 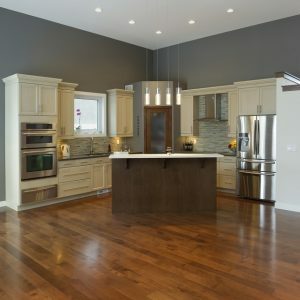 To see examples of our work or to gain inspiration for your next project, follow us on Facebook, Twitter, and Pinterest. This entry was posted on Thursday, March 28th, 2019	at 1:09 pm	and is filed under Millwork	. You can follow any responses to this entry through the RSS 2.0	feed. Both comments and pings are currently closed.